The Travelon Anti-Theft Signature Slim Backpack combines fashion with function. The roomy main compartment has RFID blocking card slots, an open top wall pocket, zippered wall pocket and tethered key clip with LED light. There's a hidden slash pocket under the flap, perfect for sunglasses or a smart phone. The Anti-Theft features include slash-resistant construction, locking compartments, slash-resistant and locking straps to keep the belongings protected. It is constructed in pleated Nylon with antique-brass finished hardware. 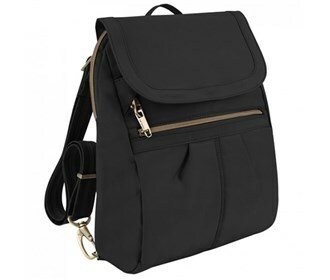 The Travelon Anti-Theft Signature Slim Backpack-Black has many exciting features for users of all types. You can extend the lifetime of your Travelon Anti-Theft Signature Slim Backpack-Black with the purchase of a FactoryOutletStore Factory Protection Plan. See the Travelon Anti-Theft Signature Slim Backpack-Black product video above for more details. 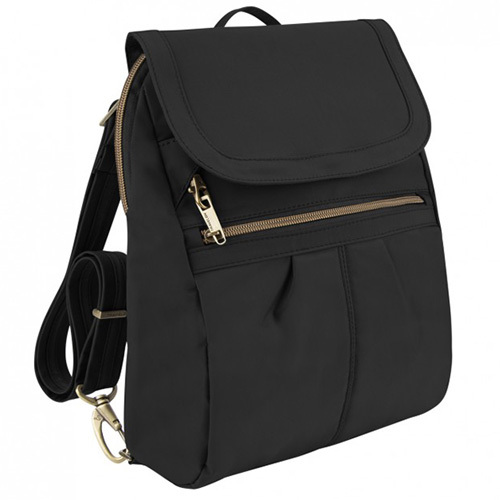 The Travelon Anti-Theft Signature Slim Backpack-Black is sold as a Brand New Unopened Item.